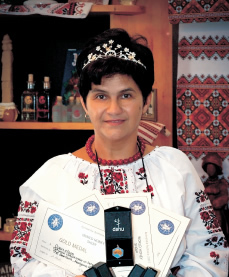 On Behalf of the Organizing Committee of XXXXIII Apimondia International Apicultural Congress and NGO “Beekeepers’ Brotherhood of Ukraine”, I would like to invite you to cooperation in preparation and holding of the XXXXIII Apimondia International Apicultural Congress from September 29 till October 4, 2013. This Congress promises to be the largest international industry event in Ukraine’s history. It will become the third at scope of events in Ukraine, after the Eurovision Song Contest 2005 and the European Football Championship 2012. More than 12 thousand visitors and participants from over 100 countries are going to come to Kyiv to visit the largest event in beekeeping industry, both on domestic and international level. Firstly, it is important to know that XXXXIII International Apimondia Congress is one of the most prestigious events on the international level that is going to gather a number of leading industry experts and specialists, researchers, apitherapists, beekeepers, both amateurs and professionals, representatives of international and national organizations, public and political figures, manufactures of the beekeeping equipment, veterinary drugs and other products related with beekeeping; exporters and importers of beekeeping products, journalists and media representatives and interested people. Secondly, I like to note that the Apimondia Congress held in Kyiv in 2013 will help to increase the interest to the Ukrainian beekeeping and attract more international and domestic investors that will also lead to the investments increasing and help to develop the beekeeping industry. We have also buit a loyal investors policy for money investments. Additionally, we are aiming to hold and take part in different events to present prepared marketing products that will show the investment potential of the beekeeping industry for the potential investors. Unique natural resources of our country, wise and experienced beekeepers – all these have formed a good base for successful capital investing. The next important reason is that the International Apimondia Congress 2013 gives a chance to draw attention of the public to a healthy lifestyle by using beekeeping products. The beekeeping product means not only different honey. It is a huge range of products including the royal jelly, bee pollen, propolis, beeswax, bee bread, bee venom, drone larvae’s homogenate and extract of wax moth larvae, etc. All these products are rich in different biologically active substances and used in cosmetics, pharmacy, food, and even in aviation and space technology. It’s hard to overestimate the importance of the International Apimondia Congress for Ukrainian and worldwide representatives, such as beekeepers, researchers, apitherapists, manufactures of the beekeeping equipment and other products related with beekeeping; exporters and importers of beekeeping products, etc. The Scientific Program of Apimondia Congress will be carried under the title: Beyond the Hive: Beekeeping and Global Challenges. We believe that in today’s dynamic and globalized world the beekeeping science have to reach beyond the narrow field of specialization and take an active position in finding solutions to such important issues as environmental pollution and exhaustion of natural resources, poverty and social inequality, cultural barriers, pandemics, and diseases of human civilization. Having discovered one of the greatest wonders of nature, bee family and its products, we have to think how we can use their miraculous power to make our world better. to improve the scientific image. The presentation of the scientific papers will be organized during 8 thematic symposia session within the work of the Apimondia Scientific Commission. The Symposia will be attended by the scientists with world names in beekeeping science and young researchers, who are just beginning their work in beekeeping direction. During these meetings delegates are going to sign and send open letter of resolution for UN General Assembly consideration that will contain specific proposals of participation of the beekeeping community in the most important issues. Besides, we are expecting to sign the historic act of recognizing of the western honey bees or European honey bees (Apis mellifera) as the species under threat of extinction. to improve your company image, etc. Every next Apimondia Congress we observe that more and more companies want to participate in the International Exhibition ApiExpo for obtaining a good position for all of them and making their products and services known to the rest of the world. Social and Cultural Projects are going to attract participants with its actuality and possibility to learn new, unique and extremely useful information. It is a great way to communicate with like-minded people on subjects that are interested for you. The Tourism Program is going to give the participants a chance to discover a unique nature of the Ukrainian Honeyland that has old traditions of beekeeping. The variety and originality of beekeeping of each region have created conditions for increasing interest in Ukrainian beekeeping and in Ukraine in general. But still it is terra incognita for beekeepers worldwide. For that reason Apimondia 2013 held in Ukraine is a huge chance for beekeepers from all over the world to discover this unique Honeyland. With the productive fund of the beekeeping industry has about 400,000 beekeepers and more than 3.7 million bee colonies and the gross annual output of honey reaches 80,000 tons, Ukraine is one of the top five countries leading in beekeeping and is on the fifth place in the world, after China, Turkey, Argentina and the United States. The Tourism Program will include the tours to the most interesting and modern objects of the agricultural sector, leading research institutions, laboratories, bee products processing enterprises and beekeeping equipments manufacturers, apiaries and recreational centres, etc. Also you will visit significant historical and cultural places of Ukraine. The Honey World Championship has already gain popularity among the beekeepers and beekeeping companies. The Championship nominees will be awarded for their efforts, hard work and achievements. The World Honey Queen will be awarded with the crown and is going to become the pride of the beekeepers worldwide. I invite partners and sponsors to cooperation that gives many opportunities to promote their company and its brands, to establish new contacts and to find the potential customers or buyers of their products and services during the preparation and holding periods of the International Apimondia Congress 2013. I invite students, young researchers and active, sociable people to cooperation in our projects. I invite journalists and media representatives to assistance . As they will be given an opportunity to report on the activities held during the preparation and holding period of the 43rd International Apimondia Congress 2013 and help all interested people to be informed on the updates and events of the congress. This cooperation is going to attract more participants that will have a chance to taste this sweet theme thanks to the beekeepers’ efforts and hard-working bees. Such event as XXXXIII International Apimondia Congress is going to have a great influence not only over the development of the beekeeping industry in Ukraine, but also will strengthen the image and prestige of the country in the world and help to establish many important international relations that will significantly enrich the world’s apiculture.